As you can see from the photograph above of my two Westies – Whisky and Brandy – that, believe or not, I do actually like to dress my dogs up for Christmas day. I can’t quite believe it myself as I’m not a great believer in dogs being made to wear clothing, unless of course it is for a practical purpose like keeping them warm, dry or clean. So why have I done this? 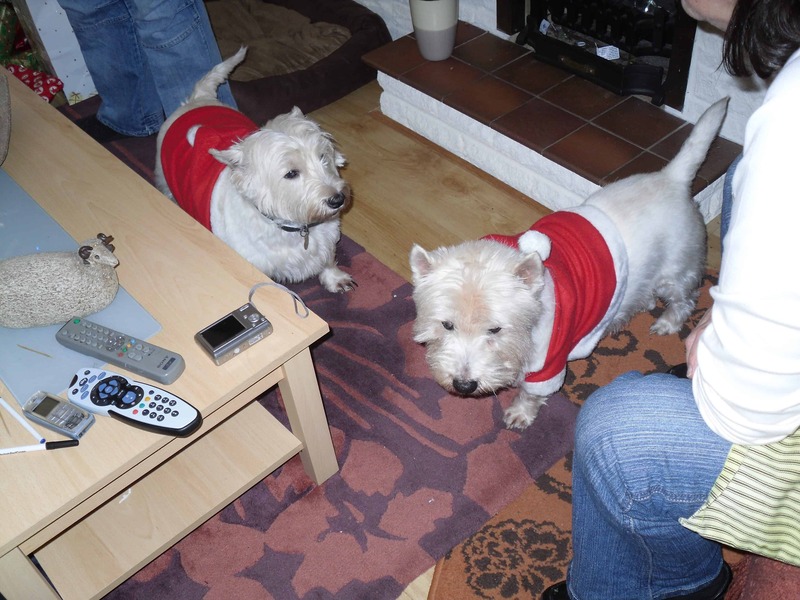 Well first of all I just love Christmas day so it helps everyone including the dogs to get in the holiday mood. They get all excited when they have their Father Christmas costumes put on and I think maybe they begin to realize that the day is not like any normal day. And secondly my Mum bought the outfits!!!! I have had a lot of disappointments along the way with buying doggy Christmas clothing as my dogs just won’t tolerate wearing it. They are quite happy to have a coat like nolvadex online forum piece of clothing as they are used to wearing a coat outside when its raining or very cold. However I once bought some deer antlers that have LED lighting in the antlers that are attached to a headband. They simply would not allow me to put them on. One set of antlers actually got chewed to pieces and the only way I could manage to get a photograph was by holding the antlers firmly around their heads for a couple of seconds. I guess this is because they are Westies and so will always try to attack and destroy items they feel aggressive towards. Contrast this with my sister’s dog Dennis who is a Staffordshire Bull Terrier. He will let her put anything on him for as long as she like. I often see pictures uploaded of Dennis wearing sunglasses, hats and tinsel and he just doesn’t mind at all. I guess it just the tolerance levels in the different breeds of dogs.